Music – Stu Phillips, Theme – Stu Phillips & Glen A. Larson, Special Effects Consultants – David M. Garber & Wayne Smith. Production Company – Glen A. Larson Productions/Universal. Director – Vince Edwards, Screenplay – Glen A. Larson, Story – Glen A. Larson & Ken Pettus, Producer – David J. O’Connell, Photography – Frank Thackery, Art Direction – Mary Weaver Dodson. Director – Christian I. Nyby II, Screenplay – Jim Carlson & Terrence O’Donnell, Story – Michael Sloan, Producer – Terrence O’Donnell, Photography – H. John Penner, Art Direction – Richard D. James. The Galactica encounters another surviving battlestar The Pegasus, led by the legendary Commander Cain. Commander Adama turns down Cain’s idea to combine forces to mount an attack on the inhabited Cylon planet Gamoray to obtain needed fuel supplies and settles for the lesser target of two Cylon tankers instead. Cain deliberately destroys the two tankers, forcing them to attack Gamoray, a suicide mission that the others see as Cain’s desire to go out in a blaze of glory. Meanwhile, during an attack, a Cylon kamikaze fighter rams the Galactica, setting one of the decks on fire, leaving people trapped inside and Commander Adama in a coma. Producer Glen A. Larson had considerable success with Battlestar Galactica (1978), the pilot episode for his Battlestar Galactica (1978-9) tv series, which was released cinematically around the world in a slightly edited form from its tv premiere. Battlestar Galactica was a blatant ripoff of Star Wars (1977) but the cinematic release nevertheless proved a considerable success. That success mandated this second film, which was released cinematically outside the USA. Here Glen A. Larson has assembled the two-part episode The Living Legend, along with about fifteen minutes from the episode Fire in Space. Although, the irony of this is that by the time that Mission Galactica: The Cylon Attack was seen theatrically by most of the world, the tv series itself had been cancelled. This would be followed by a further re-edited cinematic release, Conquest of the Earth (1981) taken from episodes of the short-lived follow-up series Galactica 1980 (1980). The Living Legend is a dull choice for a cinematic release. (Although, there were not that many worthwhile episodes to consider – War of the Gods might have been more interesting). Battlestar Galactica had been quickly thrown together to exploit the success of Star Wars and many of its stories simply transposed Westerns and war stories into a space opera setting, retelling the likes of Shane (1953) and The Dirty Dozen (1967). The Living Legend was essentially Battlestar Galactica‘s rewrite of Patton (1970). 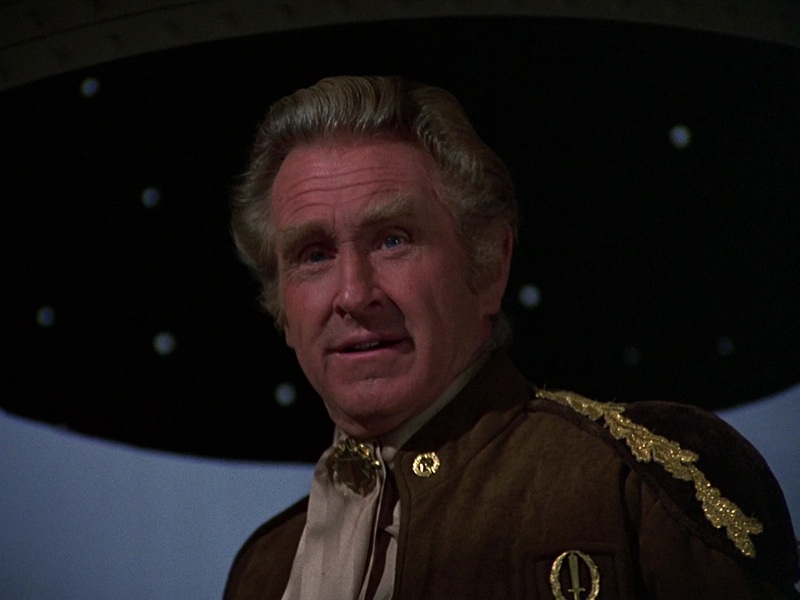 Here Lloyd Bridges gives an enjoyably crusty and irascible performance in the Patton part, welcomely ruffling the stolidness of Lorne Greene’s Adama. However, the action and the story are not particularly interesting, even less so on the big screen. Why portions of the Fire in Space episode were edited on the end is a big question – it seems like is an ungainly extended climax that emerges out of nowhere in the last few minutes and fails to work. There are other elements that do not make sense. In the first film, we saw John Colicos’s Count Baltar being dragged off to be executed – scenes that were specifically added to the cinematic version and not shown in the tv pilot. Baltar then became a regular villain in the series. With international audiences not having seen the tv series when Mission Galactica came out, we are faced with Baltar inexplicably alive again here (and John Colicos acting his head off in absurdly sinister under-lighting) as the Cylon commander to some confusion. (It was not that well explained in the series either why Cylons who want to eliminate humans so much would end up letting one of them command their fleets). Furthermore, Universal had cut costs on Battlestar Galactica, which was the most expensive tv series made at the time, by using cut-and-paste visual effects. While one became used to it on the small screen, here you can clearly see that the attack on the Cylon tanker has simply been reused from the first film. When Galactica was remade for television as Battlestar Galactica (2003-9), the Pegasus/Commander Cain story was redone in a three-episode story arc during the second season. Here the role of Commander Cain was recast with Michelle Forbes. In this series darker treatment of the original, Cain was not so much a reckless military commander prepared to endanger survival for the sake of glory but someone who runs a ship on ruthless military justice and is prepared to sacrifice all in her way, which ended up bringing the two battlestars to a point of war. The Cain story was told in more detail in the standalone film Battlestar Galactica: Razor (2007). Glen A. Larson produced one further spinoff series with with Galactica 1980 (1980). Battlestar Galactica was later reworked for tv as the excellent Battlestar Galactica (2003-9). This produced three individual releases with the mini-series Battlestar Galactica (2003) and the spinoff films Battlestar Galactica: Razor (2007) and Battlestar Galactica: The Plan (2009), as well as the prequel series Caprica (2009-10) and a further prequel web-series Battlestar Galactica: Blood & Chrome (2012).